Again, we are writing this article before official sales numbers are scheduled to be released later in the week. Because of that we’ll focus on some new information that won’t be in the release this week. Official stats in January track December sales and year-end stats which are always interesting. This tells an important, but partial story, because it only tells what has happened. Today we’ll focus on what is happening right now. Listing inventory had risen slightly for the past 4 months, but it has dropped slightly in January. Pending sales had also been dropping slightly which is probably why inventory was rising. However, pending sales have increased this January which may help account for why inventory recently dropped. While inventory has dropped everywhere, perhaps the most significant drop has been in Lehigh acres. 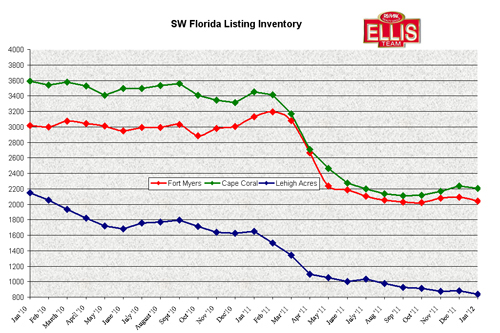 Lehigh Acres has experienced a 61% drop in inventory since January 2010. Cape Coral has seen a 38.54% drop in inventory in the same period, and Fort Myers has seen a 32.52% drop. Lee County has seen a 35.42% overall drop in single family inventory, so Lehigh Acres 61% drop leads the way by a large margin. Lehigh Acres was home to single family home sales in the $25,000-$40,000 range a few years ago and now it’s getting tough to find homes much below $70,000. Investors have swooped in and gobbled up everything they can. Homes at the lower prices were cash flowing as investors could purchase, fix them up a little bit and rent them for more return on their money than they could get at bank or other places. Another trend we have noticed is short sale closing increased as banks have geared up to handle more short sales just as foreclosure sales decreased. 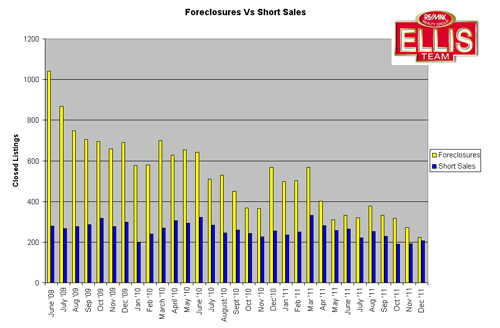 We’ve included a graph that illustrates foreclosure versus short sale closings over time. Keep in mind that banks have had fewer foreclosures due to the robo signing issue and that has affected foreclosure inventory throughout 2011. We’ve been told to expect more foreclosures in 2012, however they will not process them as fast as they did back in 2009 which caused the whole robo signing legal fiasco in the first place. Next week we’ll go inside the official numbers and give additional background as to what drove the numbers and how 2011 ended compared to previous years. Going forward we are seeing a robust selling season as many have realized our median prices have been on the rise and the bargains may be running out. If rising pending sales, rising median sale prices and decreased inventory are any indication heading into season, the next few months could be interesting to watch. Setting realistic expectations is key for buyers and sellers in this market. Realistically, prices have room to rise especially as the economy improves. Nobody is predicting a return to 2005 prices anytime soon, so if you read prices are rising and you’re waiting 6 months to put your home on the market so you can get what you paid back in 2005, you might want to reset your expectations. We are back to healthy growth, and if we somehow miraculously escalated back to 2005 prices, it would be as unhealthy now as it was back then. Slow and steady might just be what the doctor ordered, and who knows, that might just be what we’ll get. Posted in Southwest Florida Real Estate, SW Florida Bank Foreclosures.Tagged Cape Coral Florida, Fort Myers Florida, Lehigh Acres Florida.